Mikhail Vasilievich Lomonosov M. V. Lomonosov, is known as the father of Russian science, an outstanding poet, founder of Russian literature and creator of the Russian language. Lomonosov was born on the 19 th of November [O.S. on the 8 th of November ], 1711 in a fisherman’s family, near Kholmogory in the village of Denisovka (later renamed Lomonosovo in his honor) in the Arkhangelsk Governorate. 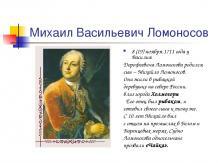 Lomonosov was born on the 19 th of November [O.S. on the 8 th of November ], 1711 in a fisherman’s family, near Kholmogory in the village of Denisovka (later renamed Lomonosovo in his honor) in the Arkhangelsk Governorate. When he was 19, Lomonosov went on foot to Moscow where he entered the Slavic Greek Latin Academy. The Academy was closed to peasants and Lomonosov had to hide his peasant origin. He pretended to be of noble birth. When he was 19, Lomonosov went on foot to Moscow where he entered the Slavic Greek Latin Academy. The Academy was closed to peasants and Lomonosov had to hide his peasant origin. He pretended to be of noble birth. Here he studied Latin and mastered it in a short period of time. At that time he was hard up, for his only income was a stipend of three kopecks a day but he made rapid progress scholastically. He completed a twelve-year study course in only five years, graduating at the top of his class. Here he studied Latin and mastered it in a short period of time. At that time he was hard up, for his only income was a stipend of three kopecks a day but he made rapid progress scholastically. He completed a twelve-year study course in only five years, graduating at the top of his class. He was a brilliant pupil and in 1736 he was sent abroad at the University of Marburg. While abroad Lomonosov studied philosophy, physics, mathematics and foreign languages and even began writing poetry. He also developed an interest in German literature. He was a brilliant pupil and in 1736 he was sent abroad at the University of Marburg. While abroad Lomonosov studied philosophy, physics, mathematics and foreign languages and even began writing poetry. He also developed an interest in German literature. Lomonosov strove to upgrade the quality of Russian science and education. He founded Moscow State University in 1755. This university, officially named after Lomonosov, is at the apex of the Russian system of higher education. Lomonosov strove to upgrade the quality of Russian science and education. He founded Moscow State University in 1755. This university, officially named after Lomonosov, is at the apex of the Russian system of higher education. 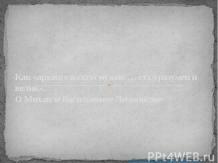 A. Pushkin said about Lomonosov , A. Pushkin said about Lomonosov , « Lomonosov was a great man…. He founded the first Russian university: or to express it more correctly he himself was our first university». 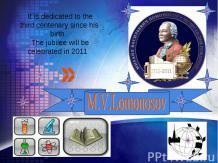 M.V.Lomonosov made many important discoveries in different fields of science: physics, chemistry, astronomy. The last period of Lomonosov’s activity was connected with his scientific invesnigation in navigation. He tried to find a short sea route from the West to the East through the Arctic Ocean. In this field as well he was ahead of his age. M.V.Lomonosov made many important discoveries in different fields of science: physics, chemistry, astronomy. The last period of Lomonosov’s activity was connected with his scientific invesnigation in navigation. He tried to find a short sea route from the West to the East through the Arctic Ocean. In this field as well he was ahead of his age. His literary works remain one of the most significant pages of Russian literature in the 18 th century. He wrote verses, odes and poems. 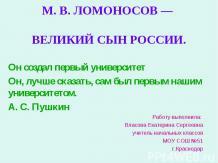 He also laid the basis for the scientific study of the Russian language, he wrote the first Russian grammar. Russian critic Belinsky wrote of Lomonosov, «Our literature begins with Lomonosov; he was its father and mother,he was its Peter the Great ». Russian critic Belinsky wrote of Lomonosov, «Our literature begins with Lomonosov; he was its father and mother,he was its Peter the Great ». M.V.Lomonosov was also a talented artist. He revived the ancient art of stained glass mosaic in Russia, and he himself created several stained glass pictures. M.V.Lomonosov was also a talented artist. He revived the ancient art of stained glass mosaic in Russia, and he himself created several stained glass pictures. In 1765, Lomonosov caught a cold and died on the 15 th of April [O.S on the 4 th of.April ], 1765 at age 54. He is buried in the cemetery of Alexander Nevsky Monastery in St Petersburg . In 1765, Lomonosov caught a cold and died on the 15 th of April [O.S on the 4 th of.April ], 1765 at age 54. He is buried in the cemetery of Alexander Nevsky Monastery in St Petersburg . 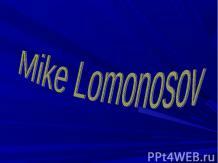 Lomonosov is widely known and honoured in our country. He occupies a central place in the history of Russian science. The Russian Academy of Sciences awards Lomonosov honorary medals in scientific achievement - one to a Russian and one to a foreign scientist. 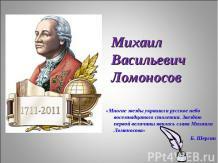 Lomonosov is widely known and honoured in our country. He occupies a central place in the history of Russian science. The Russian Academy of Sciences awards Lomonosov honorary medals in scientific achievement - one to a Russian and one to a foreign scientist. Lomonosov is memorialized in many place names - Moscow University was named after its founder and monuments to him have been erected in Moscow, St Petersburg , Arkhangelsk , Severodvinsk , the village of Lomonosovo and Koryazhma. Lomonosov is memorialized in many place names - Moscow University was named after its founder and monuments to him have been erected in Moscow, St Petersburg , Arkhangelsk , Severodvinsk , the village of Lomonosovo and Koryazhma. In 1957 the name of Lomonosov was given to the Arkhangelsk State Pedagogical Institute, now the Pomor State University&nbsp;named after M.&nbsp;V.&nbsp;Lomonosov. In 1957 the name of Lomonosov was given to the Arkhangelsk State Pedagogical Institute, now the Pomor State University&nbsp;named after M.&nbsp;V.&nbsp;Lomonosov. The theatre, the town library and an avenue in Arkhangelsk bear Lomonosov’s name. The theatre, the town library and an avenue in Arkhangelsk bear Lomonosov’s name. His name is also found on the map of the world: a stream in the Atlantic Ocean, mountain ranges of Novaya Zemlya and Spitsbergen, a plateau in Greenland, an underwater mountain in the Arctic Ocean and even a crater on the Moon were named after the great scientist. They commemorate his achievements in Geography , Oceanography and mapping. His name is also found on the map of the world: a stream in the Atlantic Ocean, mountain ranges of Novaya Zemlya and Spitsbergen, a plateau in Greenland, an underwater mountain in the Arctic Ocean and even a crater on the Moon were named after the great scientist. They commemorate his achievements in Geography , Oceanography and mapping. Every year scientific Lomonosov Readings are held in Arkhangelsk. Scholars from the best-known research centers of the country come to take part in them. Every year scientific Lomonosov Readings are held in Arkhangelsk. Scholars from the best-known research centers of the country come to take part in them. Complete these networks with as many branches and words as you can. After reading activities 1. What are these historical dates remarkable for? 1711; 1736; 1741; 1745; 1755; 1764; 1765. 2. Refer. Go on to say Learning was young Lomonosov's passion. He made rapid progress scholastically. Lomonosov strove to upgrade the quality of Russian science and education. His literary works remain one of the most significant pages of Russian literature in the 18 th century. f) M.V. Lomonosov was also a talented artist. f) M.V. Lomonosov was also a talented artist. 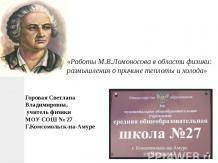 g) Lomonosov is widely known and honored in our country. 4. Explain why A.S. Pushkin called M.V. Lomonosov “our first University” 5. You are preparing for the school Conference dedicated to the third century since M.V. Lomonosov’s birth. Propose the subjects of students’ reports. Использованные ресурсы: 1. Амосова М.А., Рипинская Л.В., Н.В. Чечерина. Архангельская область.- Архангельск: Изд-во ПГПУ,2008. 2.Амосова М.А., Глущенко Э.Э., Рипинская Л.В.Методические рекомендации по курсу английского языка( региональный компонент).-Архангельск: Изд-во ПГПУ, 1994 3. Культура на Севере: учебное пособие для студентов гуманитарного профиля/Под ред.Дружининой М.В.-Архангельск: Изд-во ПГПУ, 2009.